in CAD, CAD to GBP. The Pound Canadian Dollar (GBP/CAD) exchange rate inched its way higher on Thursday, rising despite a run of disappointing UK ecostats and ongoing controversies in the Brexit negotiation process. According to the latest purchasing managers’ index (PMI), the UK’s manufacturing sector expanded at a disappointing pace in February, with the survey reading printing at 55.2, down from 55.3 in the previous period. This marked the slowest pace in 11 months, with decelerations seen ‘across the consumer, intermediate and investment goods sectors’. Firms also suffered from a steep rise in input costs, with raw materials and various other commodities rising in price. In slightly better news, however, new orders picked up, and firms continued to hire staff. ‘All sectors lost their drive as manufacturing activity crawled at a snail’s pace not seen for almost a year. Amidst these signs of a moderate slowdown, it was supply chain disruptions that were largely at fault. Suppliers underperformed not only on the timely delivery of goods but in their inability to meet the demand from makers for some raw materials. This intensified capacity issues and acted as a drag on overall purchasing activity’. Whilst this helped curb demand for Sterling against most of the majors, the Pound continued to rise against the Canadian Dollar (albeit in volatile form), largely as a result of the ‘Loonie’ suffering in the wake of the currently rallying US Dollar (USD). Canadian GDP on the Horizon – What can we Expect for the Pound Canadian Dollar (GBP/CAD) Exchange Rate? 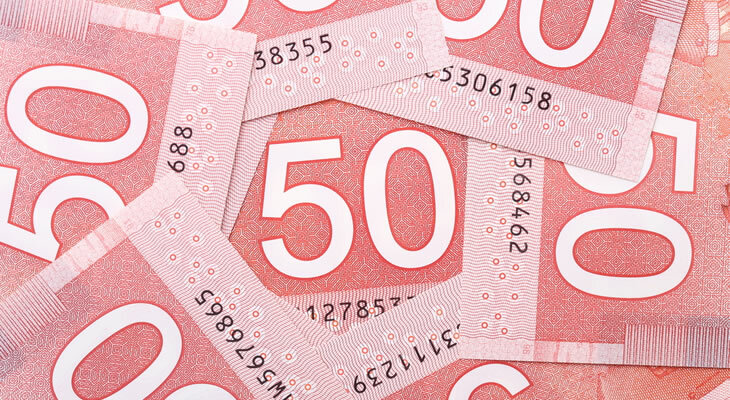 The ‘Loonie’ has seen a lot of strife lately, floundering on today’s poor RBC manufacturing PMI reading (55.6, down from 55.9) and largely being limited by the strength of the ‘Greenback’ in light of hawkish expectations for the US Federal Reserve. Looking ahead, this could continue on tomorrow’s Canadian growth readings, with the month-on-month estimate for December forecast to drop from 0.4% to 0.1%. Whilst these low expectations could trigger a positive reaction if the reading beats forecasts, the poor performance of crude oil (Canada’s primary export) over this period could have limited growth. The annualised GDP reading is expected to rise to 2% in Q4 2017, up from the previous period’s 1.7%, but this reading will likely play second-fiddle to the monthly figure. In light of this, the GBP/CAD exchange rate could continue its sporadic rise, but it should be stressed that the volatility of ongoing Brexit-related uncertainties and the various soundbites that result could continue to cause fluctuations for the Pound – particularly with tomorrow featuring UK PM Theresa May’s Brexit speech. Beyond this, the overall performance of the US Dollar will continue to be a very notable driver, with the ‘Greenback’s’ rally liable to limit the ‘Loonie’ as long as markets expect a hawkish move from the Federal Reserve in March. Anticipation has been steadily building in recent months for an earlier-than-expected rate hike from the Bank of England (BoE), particularly with the bank’s Deputy Governor, Dave Ramsden recently asserting that a rise could occur sooner, rather than later. These assessments tend to cite the same justfications; an ongoing elevated UK inflation print (almost 1% above the bank’s target), record lows of unemployment and finally, a steady acceleration in the UK’s wage growth. ‘There does seem to me more impetus on wages. We all will keep a close eye on what happens through the early part of this year to see if that forecast [in a Bank survey] of wage growth picking up to 3% is realised. But certainly relative to where I was, I see the case for rates rising somewhat sooner rather than somewhat later’. This sentiment is even more notable in that Ramsden was previously a known dove on policy, with his change in tone seeming to reflect a growing trend within members of the Monetary Policy Committee (MPC).